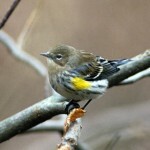 Description: Yellow underparts; streaked on breast and sides; white undertail coverts; undertail is white except for black band at tip. 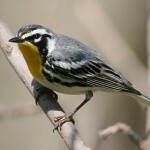 Breeding male blackish above; gray crown; white eyebrow; white wing patch; broad black eye line; broad white tail patches; and a yellow rump. Female lacks black on face; has two white wing bars; and a grayer eyebrow. 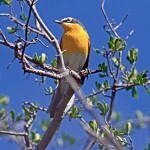 Fall adults and immatures are drabber, with grayish-olive upperparts; fainter white eyebrow; and a faint gray band across breast. Habitat: Can be found in a wide array of deciduous and coniferous habitats, but often prefer rather thick woods. Usually forage 20-30 feet above the ground. 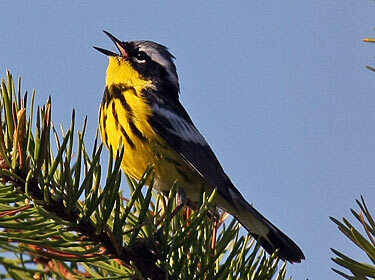 Where in Nebraska:Uncommon spring and fall migrant in eastern Nebraska, becoming rarer westwardly. Additional Information: Received its common name after it was discovered on a magnolia tree in Mississippi during spring migration.